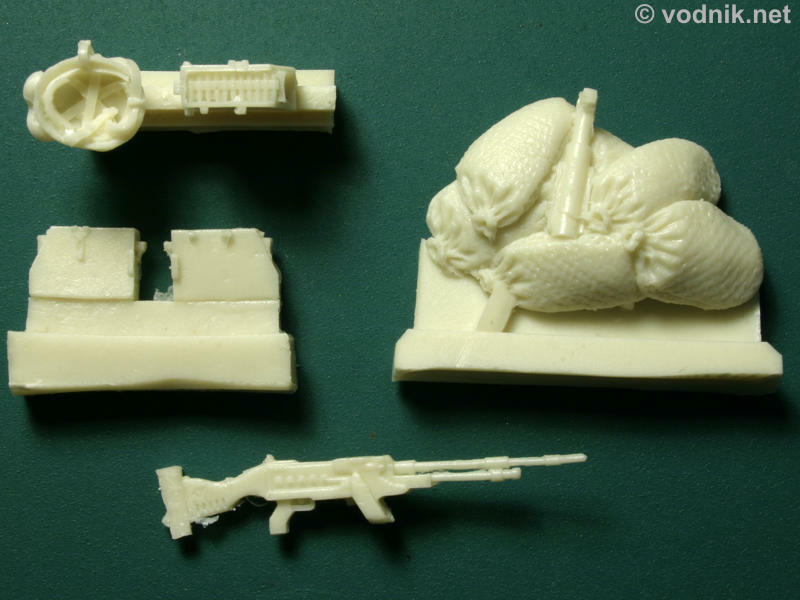 Judging from the catalogue number the set reviewed here was the first 1/35 product of Czech Goffy Model company. 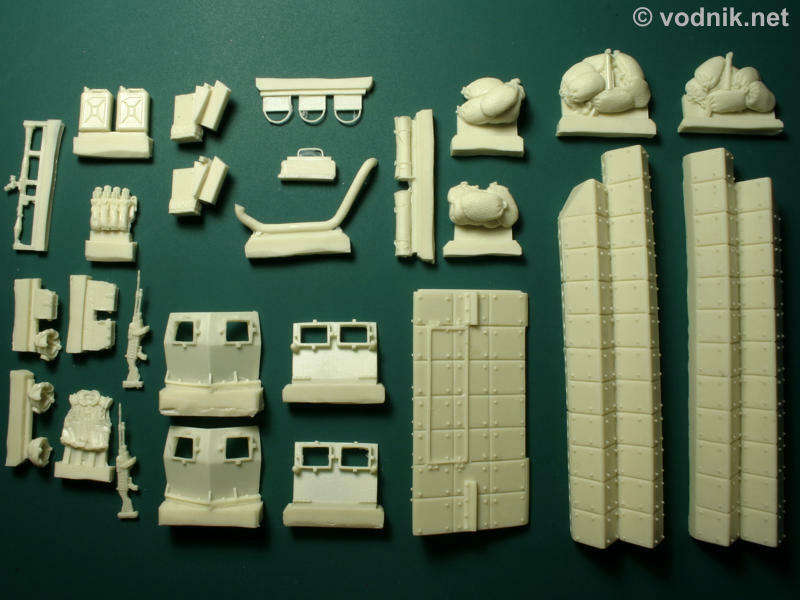 It is a resin conversion set for M113 kits, which allows for building a model of Israeli Zelda 2 vehicle (although this name is not used anywhere in the set). 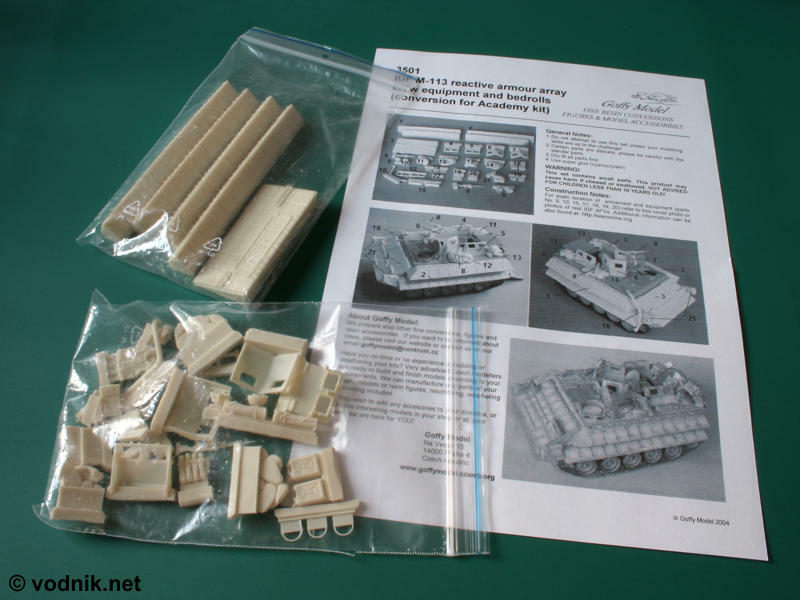 While it is described as designed for Academy kits, I'm quite sure it can also be used with Italeri, Revell (reboxed Italeri) and Tamiya kits, although Academy M113s are the best of those models. 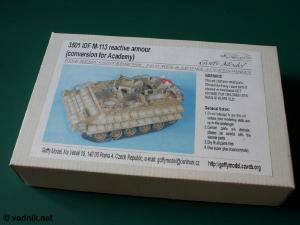 Also only Academy Zelda kit includes interior parts correct for IDF vehicle. The set comes packed in a cardboard box - quite big for a resin set: 160 mm x 240 mm x 45 mm - with a photo on the lid showing a finished model. Inside a box are two resealable zip-bags with resin parts inside. Included is also one page A4 size instruction sheet. Instructions are only in the form of black and white photos with part numbers shown on them, but the set seems to be quite easy to assemble, so those should be enough. Instructions suggest using http://waronline.org website as a reference, but while there is a lot of IDF AFVs photos there, I couldn't find a single photo of this particular vehicle. No painting instructions are provided in instructions, so you need to find your own references. I suggest NOT using the box art picture as paining reference, as it is all wrong. It shows sand color vehicle with white interior, while in reality IDF vehicles are now painted in dark greenish-gray color with light green interior. Also butts, pistol grips and handles of FN MAG machine guns should be black, not brown. It is quite surprising that an aftermarket manufacturer puts a photo of poorly researched model on the box of their product. In the set we get three large resin parts for front and two side complete "Blazer" ERA armor sets, four parts of upper hull shields, exhaust pipe, two smoke grenade launchers, three footholds and a handle, two mounts for side machine guns with sand bags molded around them, two FN MAG guns and ammo cans for them, plus some additional gear, like more sand bags, helmets, RPG-7, sleeping mats, etc..
Close up of armored shields. Note lack of any details on inner side. Some of the smaller parts - note three ammo cans. Details on all parts are crisp and I didn't notice any air bubbles on parts. Minimal amount of flash is present. Removal of resin pouring blocks should be easy for most parts, but some, like sand bags, may cause some problems and a lot of sanding may be needed. Also big armor parts require sanding excess resin away. The way Goffy packed parts in the set was not well-thought-out - the lack of any filler in the box (e.g. styrofoam or bubble wrap) make it possible for large and heavy armor parts to move freely and bang into each other. This caused the significant number of molded-on bolt head details to fell off the armor in my set. All those tiny bolt head were still in the plastic bag in which parts were packed, but reattaching them, while possible, can be a difficult task. I was informed by Petr Zatrepalek of Goffy Model that they now started adding filler material to their bigger sets, still those already on the market are packed like the one I received. 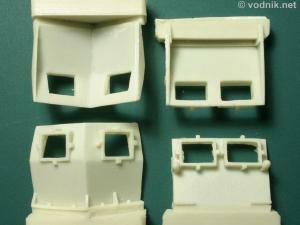 Instructions do not show placement of parts 18 - these represent wire footholds, which should be attached to the front and sides of the vehicle. 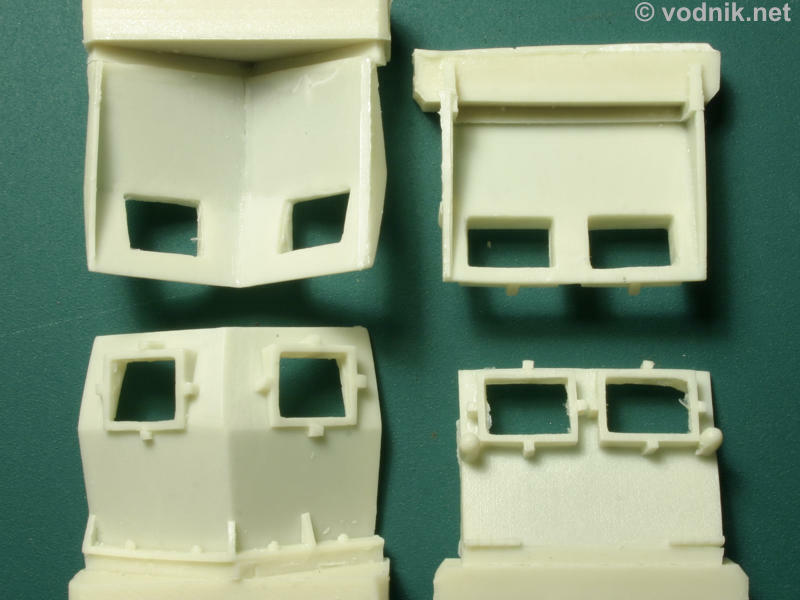 They are only listed as "equipment", together with helmets, water cans etc., and modeler is told to refer to box photo (which does not show these parts) or real AFV pics to find location of them. Additional problem is that there are only three parts "18" in the set, while four are needed - two on the front of the vehicle and one on each side of it. Another part not mentioned in instructions is part 22 - a handle which should be attached to the top of side armor part. There should be two such parts - one for each side of the vehicle, but we only get one. The number of 18 and 22 parts included in my set is not a packing error - index photo, with part numbers of all parts, clearly shows just one part 22 and three parts 18. By the way - there are just two FN MAGs shown there (one with a broken barrel ?...). The lack of parts 18 and 22 is not a big problem as they can easily be replaced with a piece of copper wire. Grenade launchers as included in the set have canvas covers on them, which don't look very realistic. The inner sides of top hull armor shields are completely featureless - I doubt they look like that in reality, but Goffy probably were not able to find any photos of that side of shields. No clear parts for armored windows in these shields are provided and instructions don't even mention the need to use such parts. 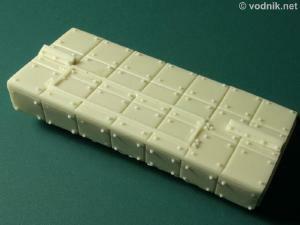 Zelda 2 conversion set is quite simple to use and drastically changes the look of good old M113. It has its flaws, but these seem to be quite easy to correct. Some details are most likely not accurate, as very little reference materials are available about this vehicle, but the model should definitely look like Zelda 2 once finished. 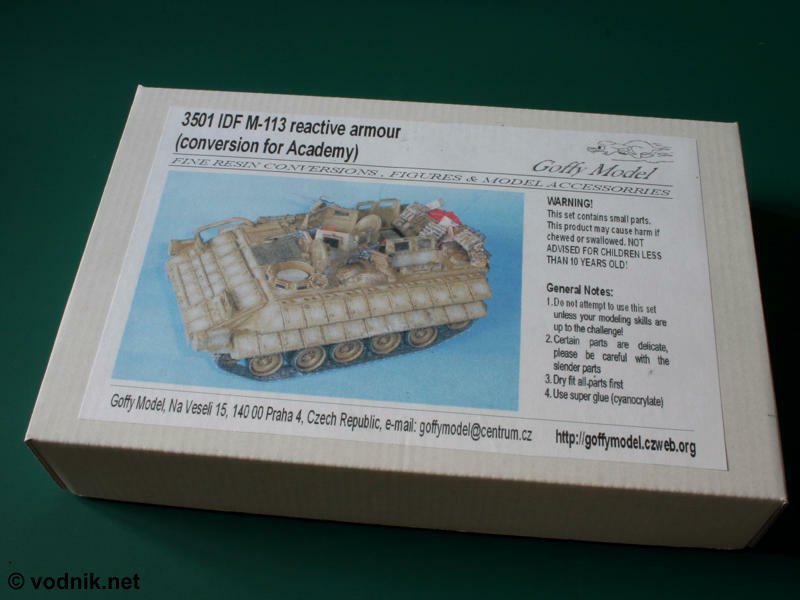 Goffy should modify instructions to show more information, add a few missing parts and use some other picture for the box art and this way they could make the set better, but even now it can still be recommended for modelers interested in IDF armor.